Alert! 303 days remain until the end of the Mayan calendar on December 21st. Yes, some experts do believe it's actually December 23rd, in which case we still have a very comfortable 305 days left. It is now time for the second installment of Apocalypse Gear - the feature that helps you, the angler, prepare for zombies. Today's episode is a double feature, and starts out with rod selection. You'll want to travel light with the undead roaming freely around your favorite waters, so it may make sense to select just one fly rod that can do it all. My pick is the aptly named Sage One, in a 796-4. This stick will handle everything - trout, steelhead, muskie, bass, salmon - and it won't shun light saltwater duty either. As an added bonus, the rod tube is solid enough to use as a bludgeon and will never give your position away with unwanted reflections due to the matte black coating. It's a good idea, even pre-doomsday, to have access to a few handy pieces of cutlery when in the outdoors. 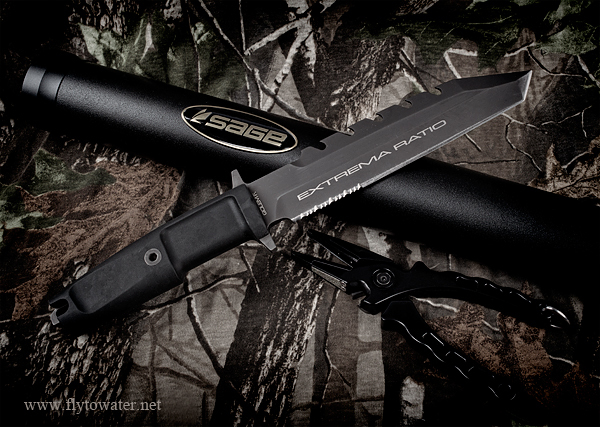 As survival knives go, I haven't found anything better than the Extrema Ratio Golem for taking into the back country. The blade is 58 HRC stainless cobalt steel, an alloy that is often used for cutting other steel. It stands up very well to chopping and prying, where knives that focus strictly on sharp edges often fall short. The Golem has a tanto point, and the blade is partially serrated making tasks like rope cutting a snap. It also offers a robust dorsal saw that, while definitely requiring some effort, cuts very well. Even the lanyard loop is a solid piece of hardware than can be used for striking, glass breaking, etc.